In England alone, approximately 4.6 million people have had both a long-term physical health condition and mental health problems. People with long-term physical health conditions are two to three times more likely to experience mental health problems. For the working age population in the UK, musculoskeletal and mental health conditions are the most common health conditions. 35.2% of all working aged disabled people in the UK experience musculoskeletal conditions only; 20.2% experience mental health conditions only; and 17.2% experience both. In policy directives and in practice, these conditions are often dealt with separately, although we are beginning to see some change now. The reality for people is that there is a relationship between their mental health and musculoskeletal conditions. However, the delivery of care for people is still often built around the individual conditions, rather than the way the person experiences them. 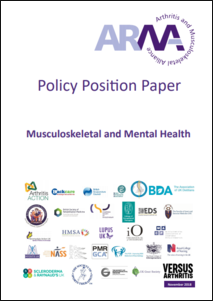 This policy position paper on musculoskeletal and mental health identifies a number of areas where patient, professional and research organisations and experts in mental and musculoskeletal conditions felt that there is particular scope for improvement. Commissioners, clinicians, providers, professional and training bodies can use these areas to identify where there are significant opportunities for positive change. 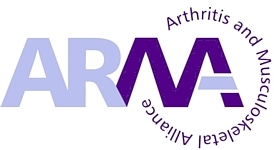 The Arthritis and Musculoskeletal Alliance (ARMA) works in partnership with its members, CEOs, directors, policy and communication professionals. This policy position paper on mental and musculoskeletal health is part of a programme of activity, including a round-table event and the flagship ARMA annual lecture for 2019. Please get in touch if you would like to work with us to promote this paper, round-table or 2019 lecture or would like us to write a blog or article for your publication or are interested in other collaboration. « Guest blog: What is Moving Medicine?